What is Flying Lizard Pose? 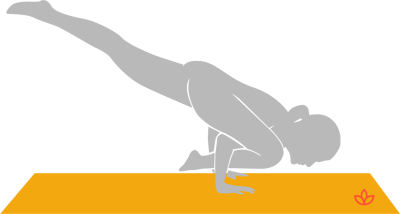 Flying lizard pose is a variation of lizard pose, or utthan pristhasana. In this arm balance, the front leg is wrapped around the arm while the back leg is lifted from the ground. Begin in downward-facing dog pose. Step your right foot forward with an exhale, then move your right arm behind your leg. Place your palm on the floor outside of your right foot. Inhale and lift the back foot off the floor. Find your balance, shift forward, and lift your right foot off the floor with an exhale. Avoid if you have a wrist injury.